Project obstacles and solutions: Kentucky is home to some of the largest whiskey distilleries in the world, particularly when it comes to the production of bourbon. 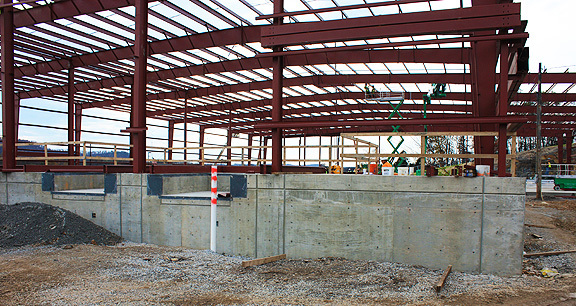 The Jim Beam Booker Noe Distillery in Lebanon Junction, Kentucky was expanding its operations to include a new warehouse and shipping facility. This follows a growth trend in bourbon production throughout Kentucky as sales of the barrel-aged mash are growing throughout the world. Ramsey and Associates were selected as the general contractor for this expansion project. The facility was on a tight deadline for turnkey operations. Timing is a critical piece of distilling bourbon. The new warehouse had to be fully functional and ready to store barrels of whiskey as they came off the line. Ramsey turned to IMI to ensure that concrete was available and delivered as the schedule demanded. IMI designed a mix that used a blend of large and small coarse aggregates that produces a very flat surface needed in warehouses. IMI supplied 2,000 yards of concrete for this project. For more information on controlling curling in concrete, contact the sales representative for the location nearest you. Click here.